The weather varies greatly with the altitude and the region in Tibet. There are all four seasons in Tibet, although some mountain areas might be rather cold even in summer because of the high altitude. Central Tibet and some southern regions can be very warm in summer, and winters are not as cold as many people imagine. Lhasa, for example, enjoys very comfortable temperatures throughout the year with warm summers and mild winters. Contrary to common belief, weather in Lhasa and surrounding areas is pleasant most of the year. Summers are typically warm with some hot days and cool evenings. Spring and fall are not very cold with lots of sunny days. Even in winter temperature rarely goes below -5 °C /23 °F and the lowest temperature can be around -10 °C /14 °F. The rainfall is higher during summer months. Monsoon season brings rains from late June through September. It is also often cloudy during that time. October through March are very dry and you can enjoy sunshine almost every day. Most of the tourists visit Lhasa starting from April until the end of November. 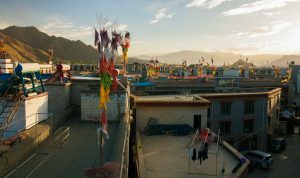 However, if you visit Lhasa during winter months, you will enjoy less crowded streets, monasteries, and other attraction sites. 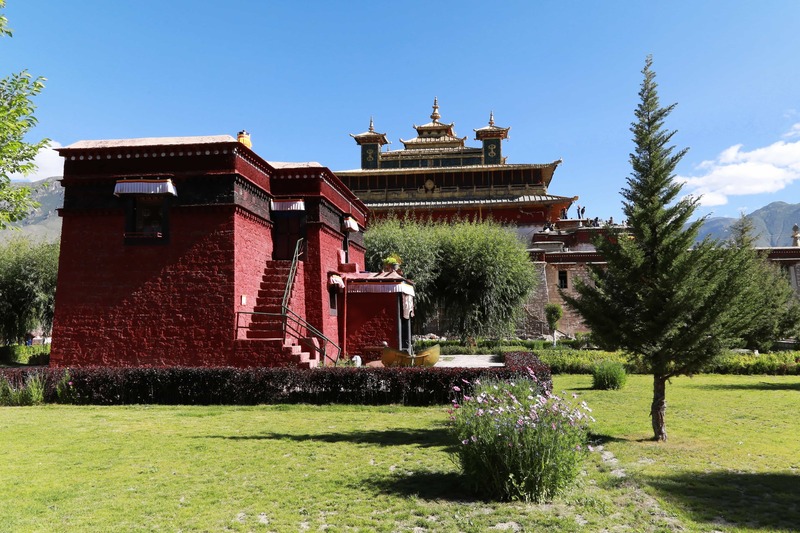 The best time to visit Lhasa is from April till the end of October. The weather in April and May won’t be hot, but there is a lower chance of rain. The temperature in June through September is warmer than in other months, but there is also a higher chance of rain and cloudy weather. If you are interested in photography, winter months might work best for you. The weather is sunny and there are fewer people visiting. Weather in Shigatse is similar to the one of Lhasa, but winters are sometimes a little colder. Winter temperatures can range from -10°C/ 13°F to +5°C/ 40°F. Summers are very pleasant and warm, the sunshine is strong. Bring a pair of sunglasses and a sunscreen. The elevation here is generally lower than in Lhasa, hovering a little over 2000 meters and the difference in temperatures is noticeable. Climate is a lot softer than in higher elevated areas. Mountains are green with plenty of grass, bushes and even high trees. The scenery is very pleasant and relaxing. Summers can be very hot. 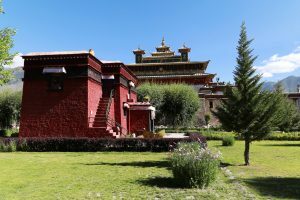 There are many great trekking routes in the area, including the famous trek from Ganden to Samye, and one day treks to Chimpu nunnery. Bring plenty of water, sunscreen and sunglasses to the trek. 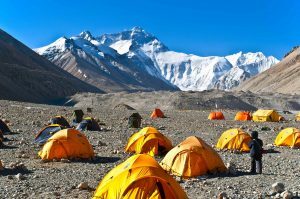 The first base camp in the Everest region is at 5,200 meters/ 17,060 ft above the sea level. It is the starting point for all the climbers who attempt to ascent the highest mountain on the planet. Due to the high altitude, the climate in this region is very harsh. Temperatures are low even during the summer time, and it gets very cold during the night. Wind is usually strong, and it feels like the temperature is even lower than it is. At the same time, the sun radiation is very strong because of the low oxygen level in the air, commonly known as a thin air. Wearing sunglasses is a must if visiting during the daytime. The best time to visit Everest Base Camp is between May and October. You will always need a warm jacket to be comfortable there. We also advise to bring warm scarf, hat and gloves. The tent camp where we are staying is open from May till the end of September. There is a stove inside the tents and plenty of blankets. You can bring your own sleeping bag or an inner sheet for a sleeping bag for additional comfort. In April, October and November, as well as in winter months, tent camp is closed. We are staying in the monastery guesthouse and the dormitory rooms are not heated. You will need more warm clothes for the trip. Another factor to consider when visiting Everest, is the rainy season. It is often cloudy in July and August. While the temperatures are comfortable during that time, clouds can obstruct the view. We usually start our hike towards the Everest very early in the morning to increase chances to see the mountain before clouds cover the sky. The trek around Mount Kailash goes above 4,500 meters/ 14,700 ft and reaches its peak point at 5,640 m/ 18,500 ft. The temperature in the area is usually significantly lower than in Lhasa area. It can snow even in summer months. Additionally, wind can be very strong. Pilgrims and visitors trek around the mountain only from late April/ May until October. It becomes very cold in the area in winter and there are no visitors. 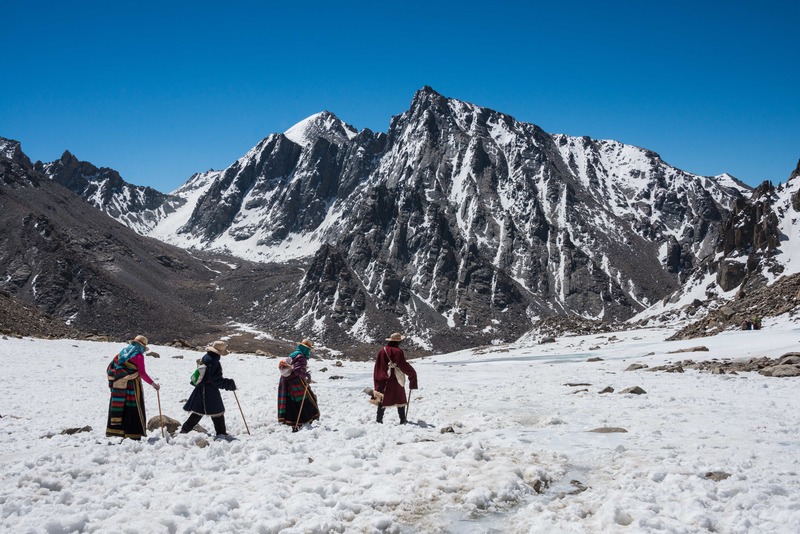 Even if you are traveling in summer, you have to bring plenty of warm clothes for the Kailash trek. You will need warm jacket, sweater, base layer, gloves, warm scarf and hat. As the sun is very strong at such altitude, you also need to bring sunglasses and sunscreen and use it throughout the day. 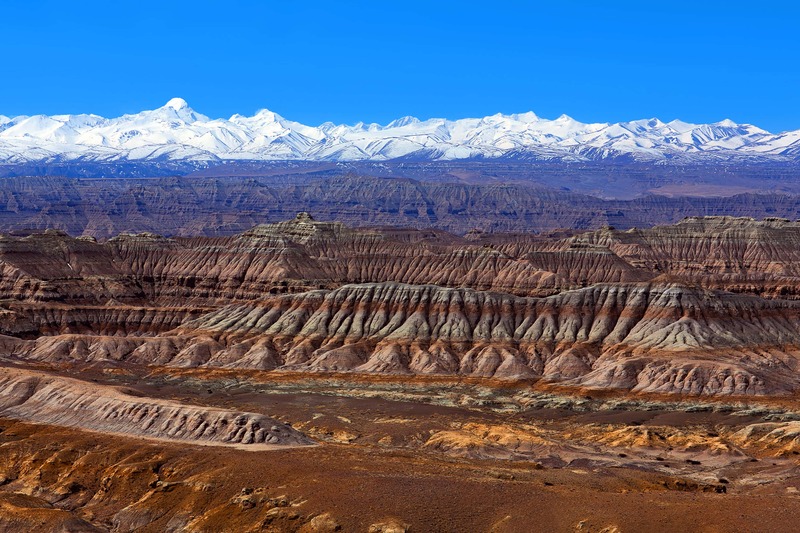 Ngari, prefecture in the Western Tibet is the coldest area in Tibet. The elevation in Ngari is over 4,500 meters/ 14,750 ft.There is a bid drop in temperatures at night even during the warmest summer months. Even in the daytime, temperatures rarely rise above 20 °C/ 68 °F. Elevation in the area is high, and the sun radiation is very strong. Additionally, this area is very windy almost all the time. 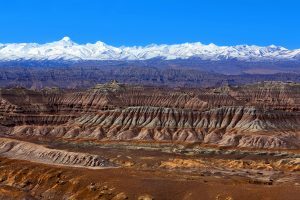 The best time to visit Ngari is during the dry months and in late spring or early fall. The most comfortable temperatures are in summer, and although it might rain in July and August, the newly built roads are very good. The largest lake in Tibetan Autonomous Region is located approximately 250km/ 150 miles to the North from Lhasa at an elevation above 4,700 meters/ 15,400 ft. Climate at this elevation is harsh: temperatures are lower than in Lhasa, wind and sun radiation are strong. Namtso is usually covered with ice until mid or end of May. During the rainy season from July till August it can snow in the Namtso area. During the winter time, from January till the end of April the road to Namtso is closed, since the mountain pass leading to the lake is frozen.